TMJ (temporomandibular joint) disorders are a family of problems related to your complex jaw joint and associated muscles. If you have had symptoms like pain or a “clicking” sound, you’ll be glad to know that these problems are more easily diagnosed and treated than they were in the past. These symptoms occur when the joints of the jaw and the chewing muscles (muscles of mastication) do not work together correctly. 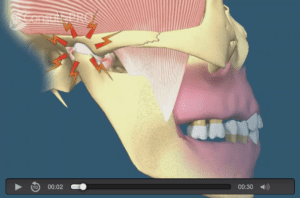 TMJ stands for temporomandibular joint, which is the name for each joint (right and left) that connects your lower jaw to your skull. Since some types of TMJ problems can lead to more serious conditions, early detection and treatment are important. No one treatment often resolves TMJ disorders completely and treatment takes time to become effective. TMJ disorders develop for many reasons. You might clench or grind your teeth, tightening your jaw muscles and stressing your jaw joint. You may have a damaged jaw joint due to injury or disease. Injuries and arthritis can damage the joint directly or stretch or tear the muscle ligaments. As a result, the disk, which is made of cartilage and functions as the “cushion” of the jaw joint, can slip out of position. Whatever the cause, the results may include a misaligned bite, pain, clicking, or grating noise when you open your mouth or trouble opening your mouth wide. Do you have teeth that no longer touch when you bite? (The bite is changing)? There are various treatment options that Drs. Blecha and Jandali may suggest to improve the harmony and function of your jaw. Once an evaluation confirms a diagnosis of TMJ disorder, Drs. Blecha and Jandali will determine the proper course of treatment. Often your restorative dentist can manage the condition. It is important to note that treatment always works best with a team approach of self-care joined with professional care. Stress management techniques such as biofeedback, physical therapy, and exercise may also be recommended, as well as a clear plastic appliance known as a splint. A splint (or nightguard) fits over your top or bottom teeth and helps keep your teeth apart, thereby relaxing the muscles and reducing pain. There are different types of appliances used for different purposes. A nightguard helps you stop clenching or grinding your teeth and reduces muscle tension at night and helps to protect the cartilage and joint surfaces. An anterior positioning appliance moves your jaw forward, relives pressure on parts of your jaw and aids in disk repositioning. It may be worn 24 hours/day to help your jaw heal. An orthotic stabilization appliance is worn 24 hours/day or just at night to move your jaw into proper position. Appliances also help to protect from tooth wear. Wearing a splint at night and as needed when symptoms develop during the day often helps. Retraining yourself not to clench your teeth during the day is likely to be helpful to your condition and symptoms. If your TMJ disorder has caused problems with how your teeth fit together, you may need treatment such as bite adjustment (equilibration), orthodontics with or without jaw reconstruction (see Orthognathic Surgery section), or restorative dental work. Surgical options such as arthroscopy and open joint repair restructuring are rarely needed, but are reserved for severe cases. Correction of bite problems with orthodontic treatment with or without jaw repositioning surgery (see orthognathic surgery) is often very successful.